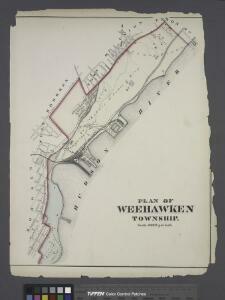 from Plan of New York City, from the Battery to Spuyten Duyvil Creek. Showing every lot and building thereon; old farm lines, strreet numbers at the corners of blocks, railroads, steamboat landings, bulkhead and pier lines, etc. Based on the surveys made by Messrs. Randall & Blackwell, and on the special survey by J. F. Harrison. Part of Wards 16 &20, New York City.